As a globally diversified manufacturer of heavy equipment and specialized engines, Caterpillar is challenged like all in the global economy to maintain exceptionally high standards for quality and cost control to compete worldwide. For a new parts manufacturing center in Torreon, Mexico, Caterpillar designed and built an advanced paint-finishing operation to address specific environmental and atmospheric conditions. 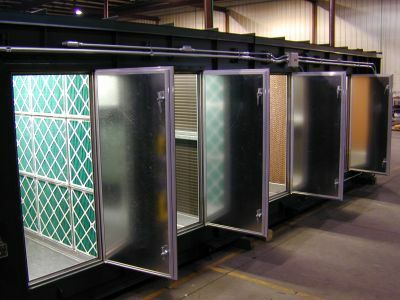 The company selected an AbsolutAire custom-designed S-Series air-handling system for the state-of-the-art paint booths. This direct-gas-fired system included high-efficiency air filtration, DX coil cooling, and humidification with evaporative media. Extremely close tolerances for both temperature and humidity are strictly maintained during system operation.